"I am a multi hobbie craft person. 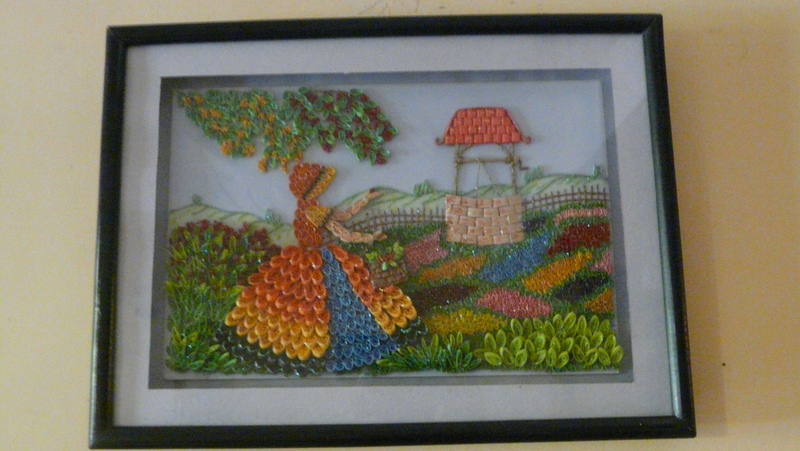 I love to experiment with paper but Quilling and Mirror Art is my favourite.I am a housewife who spend all my free time on creating something beautiful with a minimum cost as possible. I try not to copy anything from others but learn and experiment my own methods. These are all easy craft which needs patience clear mind and a bit of talent too. It gives a lot of satisfaction, peace of mind and happiness. It is in a way a meditation too. My talent for handcraft was from my very young days. There is no limit to my experiments on various handwork. you name it I try it"
I do not have a single tool for quilling that I bought. I make them.If you are a person who like quilling, and have no tools or strips, just follow the method I used. All strips in my pictures are made with 1/8" of strips cut out of A4 coloured paper. They are so cheep. Sometimes the darker shades are bit expensive.You can use a toothpick by making a small slit at the pointed end and use it to quill or get a ribbon embroidery needle and chip the tip of the eye so it would look like a needle split in two. Get an old felt pen (the pens that kids use for colouring, in case you do not know) cut of the felt point and insert the pointed side of your needle into it. You have a perfect quilling needle and that is what I use. 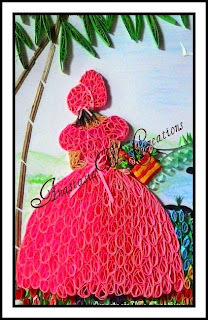 And for the basic just go to "you tube" and look for "basic quilling". There are plenty of tutorials by experience quillers. You too could be an expert in no time. But a little bit of advice, try not to do what others have done. Learn from them but try out your own pictures. It is only then that you get satisfaction and happiness of what you do." Make sure to visit Annie to see all of her great quilling and other wonderful crafts she does. It's my pleasure Annie. Thank you for sharing all of your great artistry. It's amazing! She does beautiful work! I have seen it before, maybe NAQG? 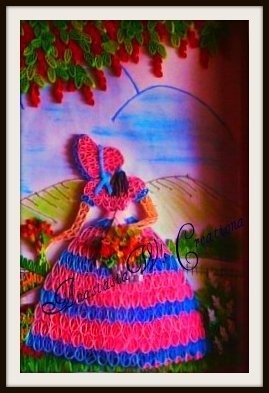 She reminds me of myself, starting out not even knowing what Quilling was and just experimenting until I was satisfied with the end result. 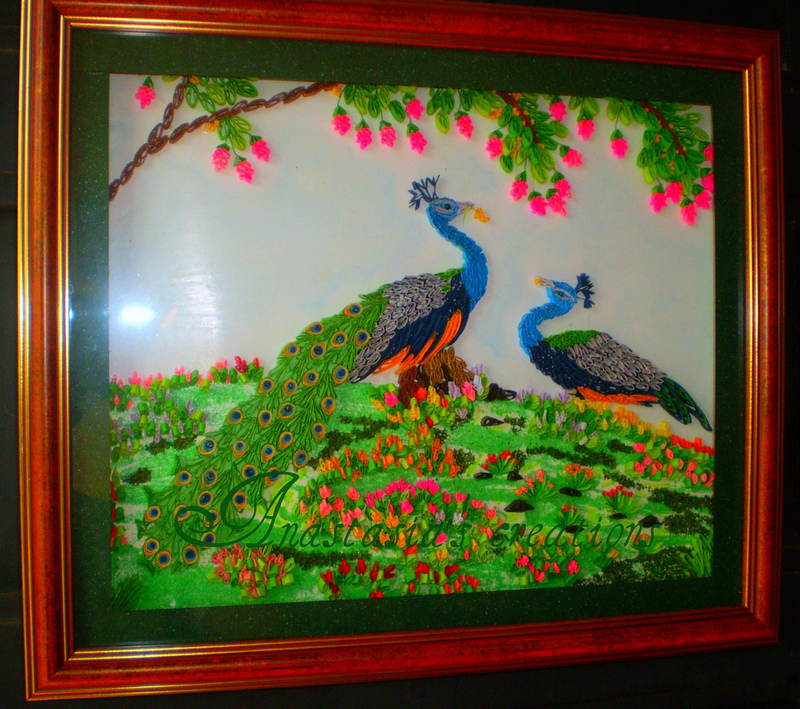 Your quilling projects are beautiful! I have never seen any projects like these. I have only seen quilling on cards. Beautiful job!